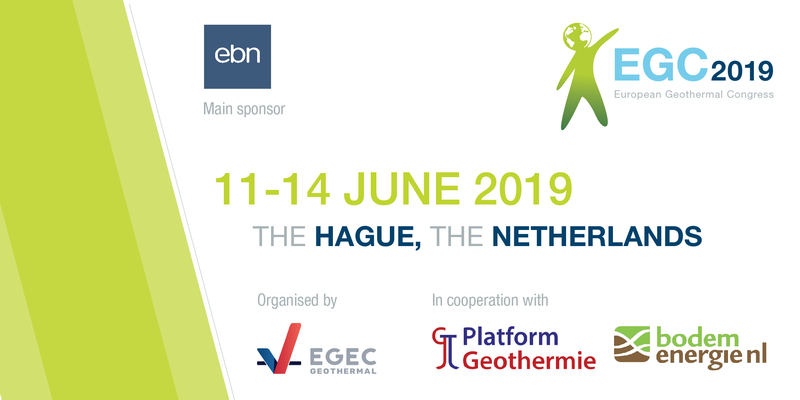 EGEC, in cooperation with Stichting Platform Geothermie, BodemenergieNL, and the main event sponsor Energie Beheer Nederland B.V. (EBN) are pleased to announce that the 2019 edition of the European Geothermal Congress (EGC) will be held on 11-14th June 2019 at the World Forum, The Hague, in The Netherlands. Organised every 3 years by EGEC, the European association representing the geothermal sector, EGC is the largest geothermal congress in Europe. Hosting a combination of events for all the geothermal sector, EGC is a unique opportunity for stakeholders from all parts of the sector, whether academic, industrial, financial, policy-making, or societal, to come together and to learn, finding new ways to progress. Geothermal energy utilisation in The Netherlands has been experiencing a tremendous growth in recent years, mainly due to the development of policy instruments that tackled barriers such as geological uncertainty, high upfront costs, and the difficulty in ensuring adequate financing. Today, The Netherlands is one of the fastest growing European market, especially in the heating sector. There are 16 large heating plants in operation and about 50,000 individual geothermal heating systems. The hosting city of The Hague, which aims to become carbon-neutral by 2040, is also looking at geothermal energy for their energy needs. In the next 5 years, at least 4 geothermal heating plants are planned to become operational in the city. Deputy Mayor Joris Wijsmuller, Urban Development and Sustainability, said: “Geothermal heat is key for the city of The Hague: it enables us to reach carbon neutrality in a cost effective way in 2040. Eventually, we expect to fulfil half of the city’s heat demand with geothermal heat. Since sustainability in general and alternative energy sources in particular are crucial issues in our city, we are delighted to welcome this year’s EGC in The Hague”. Following its established format, EGC will feature: a conference programme with both oral and poster presentations; contributions from local, national and European political leaders; sessions covering science and research, education, policy, financing, and communication; a large industry exhibition; site visits to geothermal projects; networking events … and much more. The call for papers will be announced soon. Over four hundred abstracts were submitted in the last edition, and we look forward to an even larger number of high quality submissions for this edition. To keep informed, sign up to the conference mailing list.